It's a fact that adding roses to anything makes that thing better. Dried petals decorating a wedding cake? Beautiful. A sincere, heartfelt apology plus a bouquet? Forgiven. Flower water in the spa waiting room? Fill me up. But roses do their best work when mixed into beauty products. The scent, the skin-soothing properties, the way smoothing expensive flower essence across your face makes you feel like a rich old lady with a townhouse for just a moment... it's enough to make taking off your mascara something small to look forward to on the commute home. But makeup wipes generally fall on the lowest rung of the luxury ladder. They're the things you keep by your bed to smear across your face when you're too drunk to stand over a sink, after all. And if you have easily irritated eyes, like I do, you've probably tried your fair share of ones that stung and left you red. These, however, are not like any makeup wipes you've ever met before. You can tell they're good before you even touch them to your face — there's no sort of soapy film, no annoying dispenser that pulls out three when you just want one and dries the whole batch out in time... just a neat stack of ultra-thin rounds of cotton that smell as though they've been dipped in the freshest, crispest rose water around. They're somehow always cool, too, even on the hottest days in my windowless bathroom, which makes wiping off my makeup feel just as lovely as spritzing on a mist. And that's exactly the point, since they're designed for travel: Skip the mist on the plane (it'll just dry you out more), don't even think of letting that gross bathroom water touch your precious face, and rely on these to keep your skin hydrated and happy. Or just use them in bed after stumbling in the door at 3 AM — they'll be the only thing you feel good about in the morning. 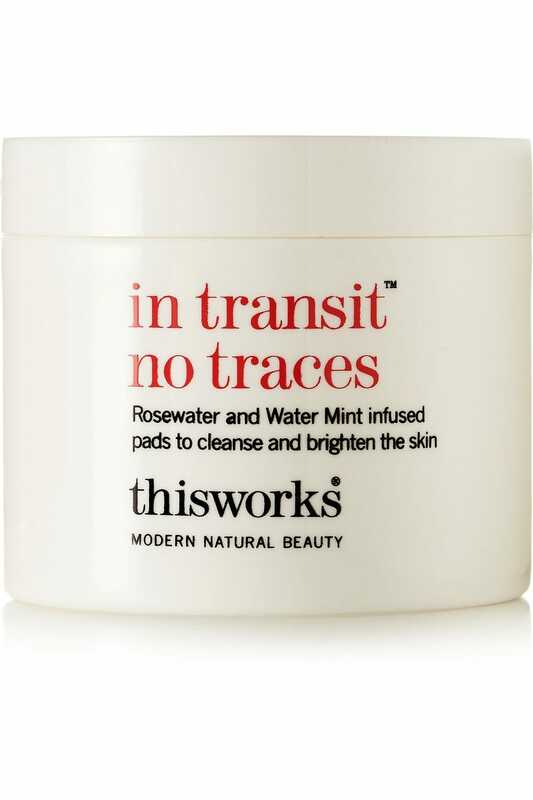 This Works In Transit No Traces, $31, available at Net-a-Porter.